With his daughter Willow invading the airwaves, rapper-turned-actor Will Smith is returning his attentions to the career of his 12-year-old son Jaden, whom he will reportedly be joining onscreen in a new, currently untitled sci-fi film directed by M. Night Shyamalan. According to Sony Pictures, the film features Will and Jaden set on an abandoned planet Earth, 1,000 years in the future, whose various dangers a young Jaden must navigate in an attempt to save himself and his estranged dad Will. They must do so as a result of their ship crashing on the desolate planet. "The chance to make a scary, science-fiction film starring Jaden and Will is my dream project," explained Shyamalan of the movie, which Jaden hinted about in an interview last year. 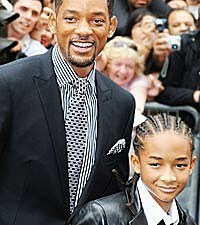 Will and Jaden last appeared together as father and son in the popular 2006 film 'The Pursuit of Happyness.' Jaden then starred in the 2010 remake of 'The Karate Kid' which grossed more than $350 million for his dad, who served as a producer on the feature. The onscreen pairing is likely to bring box office gold to the struggling Shyamalan. The director's recent projects, like 'The Last Airbender,' have suffered both critically and commercially. The as-yet-untitled film (previously, the working title of the film was '1000 A.E.') will be produced by Shyamalan and Will, along with his wife Jada Pinkett Smith. It's also written by Shyamalan and Gary Whitta of 'The Book of Eli' fame.